Heat pan and add 1 sp oil, now add chopped onions and cook till golden brown now add tomato and cook further. Add ginger garlic paste and cook till raw smell dissappears. Now cool this mixture and grind it to smooth paste adding little water. In the same pan heat 1/2 cup butter and add the onion and tomato paste. Meanwhile in a bowl add coriender powder, garam masala, chilli powder, salt, tomato ketchup, food color and mix heavycream little at a time. Now add this to the onion and tomato paste which is cooking on the stove. Put on lid and cook on medium flame for 5 mits. Now add paneer which is cut into small bite size pieces. Add little water or milk to cook for 5 more mits if the gravy is very thick. 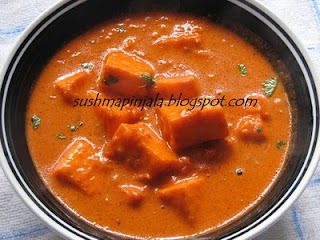 This is a very simple recipe which is usually made in during weddings and any functions back in Hyderabad. I love to have this rice with mirchi ka salan or bagar baingan. Cut all the veggies to medium pieces. Heat a pan and add oil and add shah jeera, cloves, cinnamom, bay leaves and cardomom. When cashews turn light brown and all the veggies and mix well. Now add cilantro and mint leaves chopped. 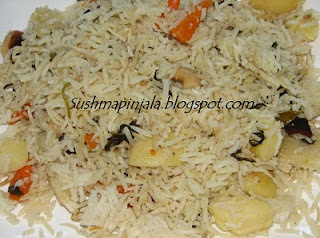 Cook for 2 mits and add washed basmathi rice without water. Stir well, add salt and fry till rice turns light brown. Now add 8 cups water mix well and transfer this whole mixture to a electric rice cooker and cook till done. If u dont have electric rice cooker all this process since beginning can be done in normal stove top rice cooker or presser cooker. Add milk to non stick pan and boil the milk on low flame. 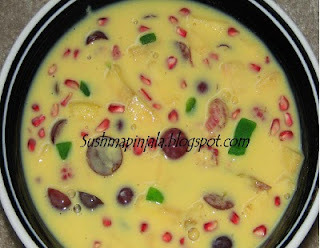 In a small bowl add 1/2 cup milk and custard powder and mix well. When the milk is 3/4 boiled add this custard mix and sugar. Switch off flame when milk is fully boiled. Let the custard milk to cool. Meanwhile cut all the fruits to small pieces. When the milk is cooled add the fruits and mix well. Add sugar if needed and chill in fridge. Serve cold asit is or with any ice cream.